As much as I love Singapore Airlines in the air, they’re an absolute pain in the arse to deal with on the ground. Furthermore, getting into a Singapore Airlines premium cabin can be a challenge. Actually, as of now you won’t find a single first or business class award seat on Singapore Airlines from the US to anywhere for any date. How that’s allowed under alliance rules is beyond me. Anyway, they have made one smart decision. Up until now A380 “Suites Class” was only available using the “R” bucket, so on a first class fare you couldn’t fly the A380, since they don’t have First Class, but instead have Suites Class. I guess they realized how their front cabins were always going out empty, so according to SQTalk they’re now releasing “F” seats for flights starting August 1, meaning you can book a segment on the A380 if you’re on a paid first fare. Unfortunately they’re not releasing “A” seats, which are discounted first class seats, but hopefully one could waitlist for “A.” This also means you can book a “full” award using KrisFlyer miles on the A380, but that would still be expensive as hell (a mere 972,000 miles per person for Singapore to London roundtrip). This is a step in the right direction, though. Hopefully the next step is opening up some award seats in first and business class on the 777-300ER’s, A380’s, and for that matter, any plane from the US! There are some SQ 747 flights to USA (SIN-NRT-LAX, SIN-HKG-SFO and SIN-FRA-JFK). 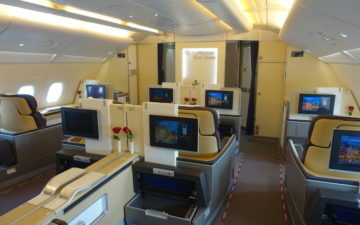 You should be able to get first and business class awards on those (perhaps not using United Mileage Plus miles). Singapore Airlines’ FFP is a complete rip off. They don’t offer cheaper class tickets for redemption when they publish 50% off on Krisflyer miles. So, you basically pay up the same amount of miles irrespective of the offer going on. I have stopped travelling Singapore airlines as much as I did in the past, now I fly domestic airlines that fly overseas. They are so much more better!